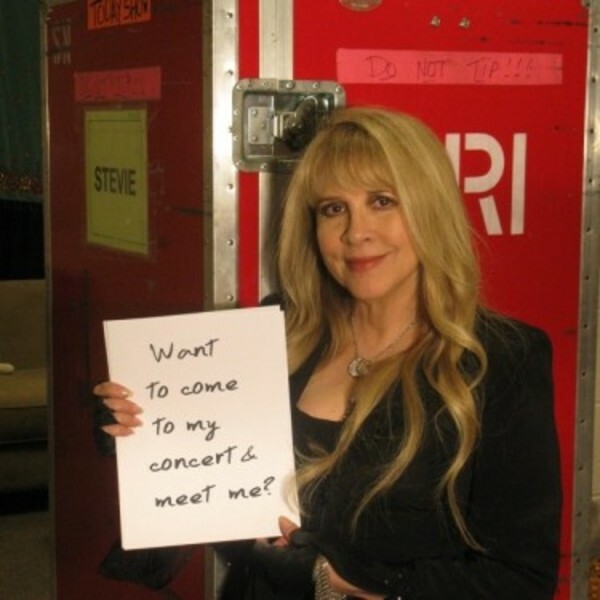 Welcome to to the new StevieNicksOfficial.com, where you can find all the latest news and information about the legendary singer/songwriter and member of Fleetwood Mac. In addition to launching her new website, Stevie has had a rather busy year. She recorded and released the album "24 Karat Gold: Songs from the Vault", she toured extensively with Fleetwood Mac, she made an appearance on the hit TV show American Horror Story, and now she is offering the rare experience to meet her in person at the December 2 Fleetwood Mac concert in San Diego! This opportunity, organized in conjunction with Road to Hope, helps provide aid for orphans in Africa. Donate $10, and you'll be entered to Win a pair of concert tickets to Fleetwood Mac’s concert in San Diego on December 2, 2014 ("Giving Tuesday") and join Pretty Little Liars’ star Torrey DeVitto to meet Stevie Nicks after the show. Package includes a one night stay at the Hard Rock Hotel San Diego in a lux Hard Rock Suite with VIP check-in and $200 dining credit for Nobu. (Estimated Value: $5000) Every $10 you donate will get you an additional entry into the sweepstakes. Learn more or Donate to enter HERE.